Kurdish Peshmerga fighters are seen in the Southwest of Kirkuk, Iraq October 13, 2017. BAGHDAD - Iraqi government forces took control of “vast areas” in the region of Kirkuk, including oilfields west of the city, in the early hours of Monday, Iraqi state TV said, but the Kurdistan Regional Government (KRG) disputed the assertions. The elite, U.S.-trained “Counter Terrorism Service, the 9th armored division and Federal Police have taken control of vast areas of Kirkuk without confrontations”, it said, and oilfields and Kurdish military positions were captured. However, a KRG security official denied that Iraqi forces were able to get closer to the city or take territory from the Kurdish Peshmerga fighters. The U.S. Defense Department urged Iraqi and Kurdish forces “to avoid additional escalatory actions”, saying in a statement it opposed destabilizing actions that detract from the battle against Islamic State militants. The United States provided weapons to both the Iraqi army and the Peshmerga to fight Islamic State militants. The conflict in Iraq helped spur a jump in world oil prices on Monday. 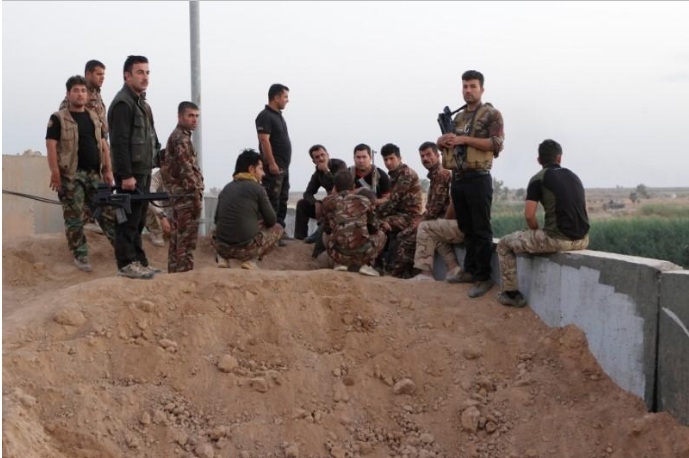 The most serious clash happened south of Kirkuk, an exchange of artillery fire between the Peshmerga and Popular Mobilisation, a mainly Shi‘ite Iraqi paramilitary force trained and armed by Iran, the KRG official said. The KRG official said Peshmerga had pushed back two assaults by the Iraqi forces south of the city and destroyed several Humvees used by Popular Mobilisation. Popular Mobilisation is providing support to the Iraqi operation in Kirkuk, according to state TV. The Iraqi government and the KRG have been at loggerheads since a Sept. 25 Kurdish independence referendum, rejected as illegal by Baghdad. Kirkuk, a multi-ethnic city with a large Kurdish community, shaped as a flashpoint because it is claimed by both sides. Residents of Kirkuk said there was no sign the Iraqi forces were getting close to the city itself, which is under the control of the Kurdish Asayish police. Tension was running high at the news of the Iraqi operation and young Kurds carrying automatic guns were seen in the streets until the early hours of Monday. There were clashes between Kurdish and Shi‘ite Turkmen groups in another city, Tuz Khormatu, about 75 km (50 miles) south of Kirkuk, but no casualties were reported. “Iraqi forces and Popular Mobilisation are now advancing from Taza, south of Kirkuk, in a major operation,” the KRG Security Council said in a statement around midnight. It also coincided with a visit to the Kurdistan region by Iranian Major General Qassem Soleimani. He is the commander of foreign operations for Iran’s elite Revolutionary Guards, who provide training and guns to Popular Mobilisation. KRG President Masoud Barzani and top Kurdish officials who met in Dokan rejected the Iraqi government’s demand that it cancel the outcome of the independence referendum as a precondition for talks to resolve the dispute. Kirkuk, a city of more than a million people with a large Kurdish community, lies just outside KRG territory, but Peshmerga forces were stationed there in 2014 when Iraqi security forces collapsed in the face of an Islamic State onslaught. The Baghdad central government has taken a series of steps to isolate the autonomous Kurdish region since its vote for independence, including banning international flights. Baghdad’s tough line, ruling out talks sought by the Kurds unless they renounce the breakaway move, is backed by neighbors Turkey and Iran - both with their own sizeable Kurdish minorities - and, in Turkey’s case, a long-running Kurdish insurgency. The United States has taken the side of the Iraqi government in refusing to recognize the validity of the referendum. Iraqi government forces took control of “vast areas” in the region of Kirkuk, including oilfields west of the city, in the early hours of Monday, Iraqi state TV said, but the Kurdistan Regional Government (KRG) disputed the assertions.